I would not have survived the transition to our new neighborhood, our new school, new jobs and from two to three kids without my neighbor, Tammy. 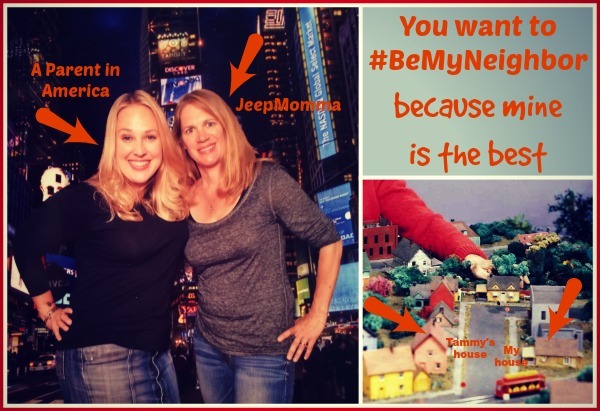 UPDATE: Tammy wrote her own #BeMyNeighbor post about ME in response! Check it out. When we moved to our home five years ago, I had no idea that the woman directly across the street would become like a sister to me and an aunt to my kids. Tammy has taken care of my kids, and me, through my pregnancy with Alice, the crazy newborn days, the move to a new school, countless playdates and kid conflicts and lock outs and playground injuries. You know you have met a winner of a woman when she is your emergency contact and she actually does spring into action when the school calls her about your child! Tammy was the first person I told when I knew I was in labor with Alice. I ran outside in the middle of a neighborhood yard sale, happily shouting to her that my water had broken. She laughed and said it was the first time she had seen me smile in a week, knowing how ready I was to have the baby. The men at the sale slowly backed away in horror as I gleefully showed her the wet backside of my skirt. Tammy’s son Ben was the first child other than my own kids to hold baby Alice. He made her a teensy paper crown in his kindergarten class and ran home to give it to her. It proudly lives in her baby book. And I have about 3,000 more stories of how this family has become essential to us. They make our world special and full of happy. The love Tammy and her family give to me and mine makes me feel like we seriously live in Mister Rogers’ Neighborhood, a show I watched religiously as a preschooler. I love living within a world in which neighbors literally drop in with interesting things to show my children. It is a dream come true, my own Children’s Television Workshop fantasy is reality. True, there is are no puppet kings or small tigers living on my street, but I *do* live right next to the National Capital Trolley Museum. Crazy coincidence, right? I am sharing my story of my luck at living across from JeepMomma not only here on my blog, but at WontYouBeMyNeighbor.org, too. This new online destination is all about celebrating incredible stories of modern-day neighborliness. You can submit your stories for WontYouBeMyNeighbor.org easily. Just post to Facebook, Twitter or Instagram using the hashtag #BeMyNeighbor. Your stories will be shared on the site, inspiring others to do neighborly acts of their own. Do you have a neighbor as awesome as Tammy? Give her a #BeMyNeighbor shout out! This post is brought to you by the Fred Rogers Company and The Motherhood. All opinions are my own.